But really the point is why not breed the middle ground? Why not aim for the best of both worlds? I mean in reality a real working dog would have an off switch. But...without breed type...its not a breed. I would bet there are dogs in shelters of no particular breed that can herd, or fetch a duck to hand, or do earthdog trials or lure course. That doesn't make them purebred dogs. So to me, losing type is not an option....as type is what makes a breed...a breed. I can also compare that to "movement" judges (and breeders) who will put up anything in the ring if it has great big striding swooping ground covering movement...no matter what it looks like, or whether that movement is correct for that breed. Well...you can find good movers in mixed breed dogs, too. Movement does not make a purebred dog...breed type does. Amen. But, I will tell you this...in my breed "working ability" is sometimes used as an excuse to produce hyper, barky, nippy dogs that are NOT good pets and not enjoyable as such. It is an excuse for a dog that bites first, asks questions later. It is easier to say "well, that's just how the breed is", rather than fix it. It is an excuse for a dog that lacks breed type when it is a fact that typey dogs can and do herd, and can and do do it well. So when I am asked why I choose to not live with dogs with "normal" Pem temperaments...I say I do live with them...they are just "different normal" than some. My dogs are not bred to be stupid lumps who sit on the couch all day, but they are bred to be typey companions that are a pleasure to live with, that love to do whatever you have in store for them, and that are not genetically prone to anxiety or nippiness or dominance (this does not mean they cannot become those things with a little help from irresponsible owners). No thats not the way it works. There were breeds before there were physical standards. And I am not saying throw away conformation req. I am saying don't breed primarily based on looks. If you look at that thread that Laur just posted on breeds you will see how breeds have changed over time being bred for looks and what that does. Have you read about the russian fox study? Its very interesting how breeding for a behavior characteristic they changed the fox phenotype. I am saying why NOT breed dogs with in the breed standard.. ALL of the breed standard, not just the physical one? ETA: just cause its normal doesn't mean its breed standard. Around here there are JRT breeders breeding nice looking conf winning JRTs who can practice stacking whilst standing beside the JRT race track (whilst racign is going on)!! these dogs have little drive. yes, I've read the fox study, its very interesting. And I agree, a breeder should breed for ALL of the standard, but the essence of any breed standard is breed type...or its not a breed. And, the beauty of that standard is that each of us interpret it a bit differently,while still within the boundaries of the standard...while still doing the breed justice. Thats why you see different "styles" of dogs in the breed ring and the performance ring as well. Same breed, each may have correct breed type, but there are slight differences that are noticable without detracting from overall breed essence. So when my standard says: "Temperament bold yet kindly, never shy nor vicious" I am absolutely breeding dogs temperamentally to the standard. Interestingly enough...in the UK...where my breed originates, the dogs are leaning towards a much calmer, much more pack-friendly breed. Nothing in any standard says that is wrong. He also has his TD and a leg in agility and his CGC. Proud of that, too. Also have one working towards his CD. Well, most dogs should be able to get obedience titles...that really has nothing to do with what they were "bred for" originally. Yep, most dogs should be able to get a CGC and a CD. And no, a CDX with high scores, first places, perfect heeling and OTCh potential is not what they were bred for originally. Nor is THAT level of obedience title something that most dogs should be able to get. But that level of obedience does show that the hard, sharp, driven working dog is also biddable and can handle himself in a crowd of other dogs and a highly stimulating environment. But...without breed type...its not a breed. No one said to not breed for type. A dog that "bites first, asks questions later" is not a good working corgi temperament. Anyone who is breeding that has some serious flaws going on. Hyper is never desirable. Sadly a lot of people confuse hyper with energy or drive. Nippy? To some extent that's also a training issue, but in so far as it goes as a temperament issue, no it's not a good working quality. As for barky? That's what earplugs are for. I agree that hyper and nippy corgis are very much incorrect. But breeding away from that doesn't necessitate breeding out drive. A good working corgi absolutely has an off switch. I remember reading something a long time ago that said that while the corgi was an eager worker, he also was excellent at finding down times on the farm when he could catch a nap. Going back to Ares - if you put a herd of cows in front of him, he turns on and he's hard and he's fast and he's driven. If you put a couch in front of him, he'll lie down and go to sleep. That is an ideal middle ground and a dog that can both work and live in the home. Ok but why when most breeder say breed type.. they are referring to physical type. to me if you have a gorgeous BC who can't herd to save its life.. then you don't have a breed either. To me the essense isn't just the look. Its the instict, temperment, structure, movement etc. If you just go by looks then many breeds now should have different names as they don't look much like what they used too. I feel as though there is information everywhere about herding breeds carrying the trait of "aloofness" in temperament. This is also something I feel as though Lizmo already knows, and perhaps misunderstood the comments of Gizmo and 'Corgi somewhere along the line(?). I also believe this temperament trait is something that can clearly be observed with personal experience(in which Liz' seems to have lots of). At least in mine and in several of the members participating in this thread. I can read fine. You're right, I do have personal experience in the breed. Meeting breeders dogs, watching many different types of dogs, sheepdog clinics, lessons, agility lessons, etc. As far as a Border Collie's temperament, I can't remember all of the places that I've read it... in books, online, in BC forums, etc. It's also based on the hundreds of Border Collies I've met, both from stellar breeders and at trials and tournaments as well as dogs from rescue. Border Collies are a breed that wants their own space and doesn't tolerate rudeness. I never see them at the dog park. There are definitely different personality types in the breed, but I have yet to meet a BC who will romp and wrestle with a bunch of hyper Labs. I feel that meeting the dogs in a working environment, where people are taking classes regularly and/or trialing isn't the same as real life. Where I take herding classes, all 13 of the owner's Border Collies could care less about the other dogs because they're out there working and the other dogs are doing their own thing. Out in the pen just hanging with other dogs, one of her dogs bit Gonzo on the nose pretty badly when he was trying to play with her, and that was really the only time she acknowledged him in the countless times we were there. Many of her dogs are like that, and I love them, and don't find that to be a temperament flaw at all! It's in their nature. I never said that NOT being wary of other dogs meant that they would play with other dogs. No. Not being wary, in my mind, is NOT showing signs of being scared/aggressive when another dog is around. I don't give a care of the dogs play or not. Same for new people. I don't think the Border Collie should be wary of new people in terms of being scared when new people come up, barking at new people (that is not the same thing as barking at a person breaking into your house/car/etc). But that doesn't mean they go up to that person and want petting. They just wouldn't be wary/scared of a person coming up to me that I knew. Also, it's hard to tell the difference between being scared/wary of a new person petting a Border Collie and just normal Border Collie position when a person is petting it - if that made sense. You see lots of Border Collies put their ears back, tail under, etc when even the owner comes up to pet him/her. Is that wary? No. Anywhooo, I think I've made my point. Have fun. FYI, I think many of us are actually in agreement on several key points here. Also, I think this thread has turned into a really great discussion...and I wanted to thank you for that. I love to learn, love to see other intelligent points of view, whether I agree with them or not. I am not sure if I should post this here, in the middle of this good discussion, or on another thread (I do NOT want to seem spammy or like Im trying to hog threads). So, I'll put it here, hopefully the people who wanted to see the pics will wade through the discussion and find them. This is a fallacy in my breed as well. I can't tell you how many people; usually pet people, conformation only people, and those with very little experience w/ ACD's, have said "Oh that's just him/her being a cattle dog." They have gotten a bad rap for being grippy/nippy/sheep killers/dog aggressive/people fearful. Some are, to a point, its something I would love to breed away from. A confident dog on sheep/cattle/around other dogs/people is NOT nippy or fearful, or overly forceful. I get very tired of hearing lots of things being blamed on these guys being ACD's. I have come off the agility course and someone says "Oh she had a cattle dog moment at that tunnel." Uhh, no.. she either didn't read my body language correctly, or I gave the wrong body language/signal etc. Herding dogs are biddable. Sometimes ACD's have a bit more gumption to take descision making on their own if they think you are incorrect. This is why a lazy/incompetent/unsure trainer doesn't work for them. It says in our standard that they can carry out everyday tasks with little to no direction. People, especially my vets have commented on how easy my dogs are compared to other heelers in this area. While they don't like being poked and prodded by strangers, they do it because I'm there giving the OK. My fearful dog will accept being manipulated and touched by my vet as long as I can be there with her. The puppy loves the vet so far. My breed is definitely not suited to most people, and I like it that way. In the right hands, with the right breeding and upbringing they are amazing dogs though. They're growing fast!! A few more weeks and they'll be irresistable! 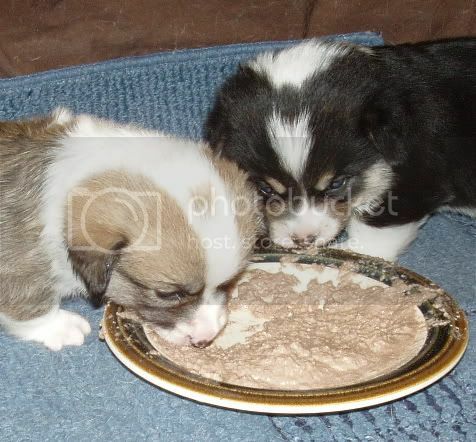 Aww... they're eating puppy food already? I can't wait to see their ears go up! I completely agree, that it's best to find a middle ground; a dog that still has the instinct and working ability, while also being a cheerful, stable family pet. But what are you doing to preserve that middle ground if you aren't working your dogs at all? I know a little Corgi from show/sport lines, who I did my HIC with, and she showed lots of promise so her owner continued to take lessons with her and went on to title her on SHEEP. Her owner couldn't imagine her polite little dog herding, before that... so it's very possible to obtain the best of both worlds. I think it's quite presumptuous, though, to expect that the herding drive/personality will just remain intact without being proven for generation after generation. Just because you want to breed practical dogs for "today", that does not mean that all dogs must have a cookie cutter, low drive, passive personality. I would not want a soft, passive Corgi, myself. If I want a soft, passive, permissive dog, I would look into getting a toy or companion dog. Corgis should be intelligent, firey, charismatic dogs on little legs... at least that's why I love them, personally. Ares, an amazing working corgi, awesome on stock, worked a herd of cattle beautifully and that was with no training - just instinct - also excelled in the obedience ring. Retired with a CDX, several wins, scores in the 190's, and when I finally got it together to handle him properly in the ring and became the handler he deserved, he got a perfect heeling score. He always heeled perfectly in training and it's a shame I couldn't be a better handler sooner. If it hadn't been for an injury caused by a training failure, he absolutely had the potential to be an OTCh dog. You don't get that kind of performance from an unbiddable dog. Ares is a prime example of how "biddable" a working Corgi really is... and adorable/healthy, too! Like you, I would much rather have a dog that keeps me on my toes and that challenges me than a soft, passive dog. That's just boring! Lizmo, I think we're confusing the word wary... by that I don't mean fearful or aggressive. I mean aware/reserved/suspicious. I don't like to see a skittish Border Collie at all! D: But I also don't want a Border Collie who greets every dog/person with the same gusto that they greet me. I want my Border Collie to regard me as a God among men. teehee! I talked to this sweet old BC man, whose dogs were sweet but wouldn't even take treats from me, at a trial. He said not to take it personally, but he didn't want his dogs to care for anyone but their master, or else everyone in town would steal them from him. He was probably right! They were amazing dogs. My puppies are usually different within "my" acceptable range of personality. Firey is not in the standard, and I don't breed for it, but like I said, I don't breed for lumps, either. Some of my puppies are "more firey" than others. But my dogs are certainly not wallflowers or weenies. I did investigate a place to do herding instinct testing, and have that option should I choose to use it. Right now, I simply do not have the time to do so and honestly, am not that worried about it. It is not in my top twenty list of priorities for my family or my dogs. That does not mean, to me, that I am doing my breed a disservice or being irresponsible. Most, if not all of my puppies are natural retrievers and I think that is one "hurdle" in seeing that they have some sort of instinct. You can watch them with the adult dogs and get an idea of what they "naturally" know. I truly believe that instinct in my breed is either there, or not and dogs that do not have it, can produce dogs that do, and vice versa. So its not something that keeps me up at night, especially since I have a dog that is titled in herding from my 07 litter and the dam, IMO, would have little to no herding ability, though I have not given her the chance. I am proud to say that many of the show dogs in my breed can do many performance events when given the chance. I haven't seen that change in 30 years, one of the things I have seen change in the dogs I surround myself with is temperaments: IMO, are more stable, calmer and easier to integrate into a family setting. Beauty and brains, it doesn't get much better than that. If I want a soft, passive, permissive dog, I would look into getting a toy or companion dog. 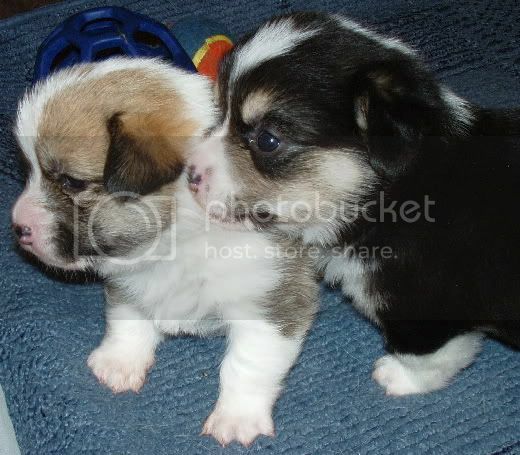 Corgis should be intelligent, firey, charismatic dogs on little legs... at least that's why I love them, personally. Like you, I would much rather have a dog that keeps me on my toes and that challenges me than a soft, passive dog. That's just boring! I just had to add, not all companion breeds are boring or lacking in fire. If you think that you've never met a pap, lol! But a herding instinct test really doesn't count. I know many breeds (like whippets and labs) that have their HIC. Retrieving what? Toys? I can guarantee you that whether or not a dog retrieves toys is not an indication of whether or not they'll herd. Also how a puppy interacts with adult dogs doesn't tell you what he'll do with stock. The ONLY way to know if a dog will herd is to put him on livestock. LOL... Paps are definitely not included in the soft, passive category! More like Mini BC category. If you aren't breeding for what the breed was meant to do (herd), then what are you breeding for? I read the whole thread, so maybe I'm totally missing something, but I don't understand...if I wanted a cute fluffy dog who would make a good house pet, I'd go rescue one. There are millions of dogs like that in shelters/rescue. They might look a little different, but they have great pet temperaments. If I ever got a pure bred dog, it would be because the temperament of the dog is something unique/special that I couldn't find in a different dog. I'm "just" a pet home, so I'll never herd cattle with a corgi, but if I got one I'd want them to have the temperament and drive of herding abilities, otherwise why would I get one?